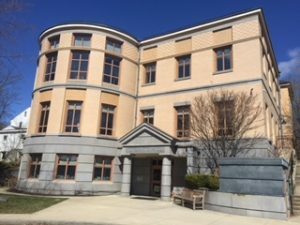 This winter, I discovered a booklet at my neighboring library, the Groton Public Library, announcing a Season of Hygge. I enjoyed reading the Little Book of Hygge and loved the helpful tips to bring more coziness and happiness into our lives with simple things like spending more time with friends and family, expressing gratitude, lighting candles, playing board games, wearing comfortable clothes, and drinking lots of hot cocoa and tea. We can learn a lot from the Danish about how to create a warm and comfortable atmosphere for our libraries and homes. 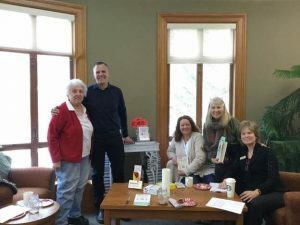 In this interview, Lisa Baylis and Deb Dowson tell us about the Groton Public Library’s experience with a Season of Hygge. What inspired your selection of The Little Book of Hygge for your community read and the theme for your winter and spring programs? 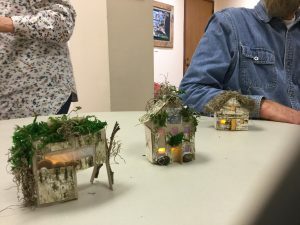 Groton Public Library: The positive joyful message, focus on natural products and experiences, encouraging small scale interpersonal connections, home grown events, and warm and cozy ideas for a winter month. Which of your hygge themed programs were most popular? Low key help yourself event with soups and make your own brownie sundaes…casual and fun!! Patrons loved that it was scheduled on first day of school vacation week. Many smiles and looks of surprise from patrons! Last week’s book discussion included sharing of why this book spoke to each of us, great Hygge ideas to try and home grown recipes. A little bit of magic happened half way through our discussion when the former U.S. Ambassador to Denmark joined us!! (He is actually mentioned on page 2 of the book.) He shared his experiences with Danish culture, answered all our questions and signed copies of the book for us. The book discussion participants got to keep their autographed library copy of Little Book of Hygge. What a wonderful day! For teens, it was making Danish Treats (no bake oat cookies and Danish Crepes) and Making Mug Cozies. We also do a program every winter that is very “hyggely”. We set up a Hot Chocolate Bar on Tuesday afternoons after school and the teens can help themselves to hot chocolate and all the fixings, and then stay to read for an hour. This was so successful the first time we tried it for winter reading, that we extended it for the entire winter, and have done it for 2 winters now. When I visited your library, I noticed a cozy fireplace reading nook that you created with orange string lights. What a neat idea! 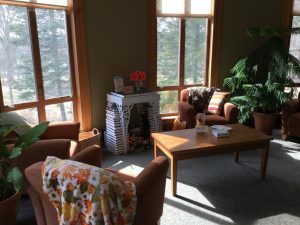 Did you make other changes to your space or library experience to generate hygge? We purchased soft throw blankets for over the upholstered chairs and added battery operated votive candles in different areas/events. For locally televised book discussion, we used cushy chairs around a coffee table instead of chairs around a table. A Hygge Café was held in a space that usually does not allow food or conversation…we successfully broke the mold!! Since the book is authored by the CEO of the Happiness Research Institute and explores how hygge is connected to why Danish people are the happiest according to the World Happiness Report, have you noticed an improvement in your patrons’ and staff’s contentment? Definitely! We noticed new relationships forming and older ones reconnecting, more positive conversations and genuinely warm and relaxed communications. What feedback have you received from patrons and staff in response to your season of hygge? Any other thoughts you would you like to share? 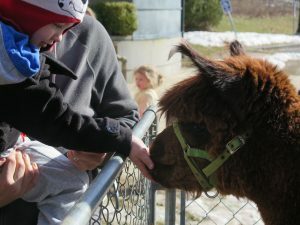 Our only disappointment was the cancellation of our Full Moon Family Night due to a blizzard. 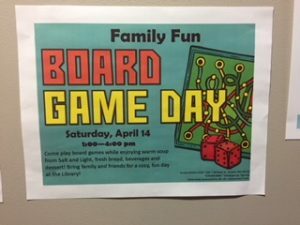 We had so much fun planned and 40 people signed up. The Full Moon Family Night would have included a fire pit in our garden in the center or our stone labyrinth, an astronomer with telescopes to try, an Owl Moon story time with Children’s Librarian, and a sing-a-long of “moon” songs. Afterwards, families would follow a votive candlelit pathway around the garden to look for owls (laminated photos placed in trees and bushes). We would have provided gourmet cocoa, cider, and mini moonpies for a treat.